Goulou (Yulin) is yellow, in the west of the Yue area. Goulou is one of the principal dialects of Yue (Cantonese). It is spoken around the Guangxi–Guangdong border, and includes the dialects of Yulin and Bobai. Yulin dialect is representative, though Bobai is better known. 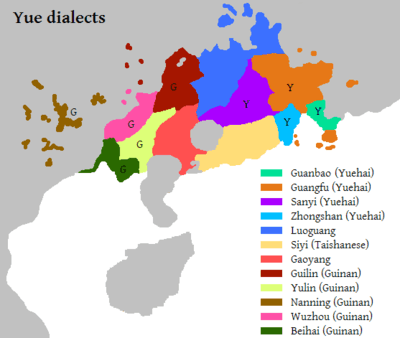 Bobai dialect is widely cited as having the most tones of any variety of Chinese, though it actually only has six, the same as most Yue dialects. The reason for the claim is that Bobai makes a four-way tonal distinction in checked syllables, whereas most other Yue dialects have three. In Yulin dialect just to the north of Bobai, however, neither entering tone is split: there are just two entering tones, 7 and 8. Lee (1993) believes that Bobai is innovative in having split 8, whereas Yulin (along with several neighboring interior Yue dialects) is innovative in having merged a former split in 7: proto-Yue probably had 7a, 7b, and 8. Many Yue varieties exhibit a "changed tone" with some semantic content. Such tones occur in the Yulin dialect, in checked syllables only, marking diminutives. In such cases, the final stop -p, -t or -k is changed to a homorganic nasal -m, -n or -ŋ, respectively, and the pitch contour is also altered. This seems to be a trace of a now-lost suffix similar to ér (兒, Middle Chinese nye) in other Chinese varieties. ↑ Hammarström, Harald; Forkel, Robert; Haspelmath, Martin; Bank, Sebastian, eds. (2016). "Guinan". Glottolog 2.7. Jena: Max Planck Institute for the Science of Human History. ↑ Tan, Yutian (2011). "The origin and nature of high rising diminutive Tone Change in Siyi Dialect" (PDF). In Jing-Schmidt, Zhuo. Proceedings of the 23rd North American Conference on Chinese Lingusitics (NACCL-23), Volume 2. pp. 190–207. This article is issued from Wikipedia - version of the 4/12/2016. The text is available under the Creative Commons Attribution/Share Alike but additional terms may apply for the media files.